Even as he advocated for repatriation and the forming of an independent African nation, The Honorable Marcus Mosiah Garvey encouraged political participation among Africans in the United States, defining politics as the process by which We ensure the government works for us. In his Ballot or the Bullet address, Malcolm X endorsed a similar philosophy, outlining a strategy that, if implemented properly, would make Black Africans’ political enemies take them more seriously. The most successful major Black radical social-political movements preceding and succeeding Garvey and X relied on a nation-building concept in which members, while finding knowledge of self, acquired vast amounts of knowledge that prepared them to upend the mental manipulation of enemy forces that enslaved the Black masses. Leaders of those organizations used their huge following to consolidate Black power and instill fear among politicians who abhorred the idea of politically conscious and aware Black African people. That’s why by the time we acquired the vote, one of the most important signs of residence in one’s community and a viable means of hyper-local civic engagement, the Babylon system was well on its way to discouraging Our use of it, and Our political self-determination as a whole. That’s why, as will be intricately explained on June 20th at Sankofa Video Books & Cafe, it’s important not only to vote as a Black Africans, but to become engaged in the political affairs of Our community so that We shape the outcomes most directly affecting Our lives. In the weeks leading up Our monthly AllEyesOnDC event, think deeply about how, during the Black Power movement, long-term political organizing, and nation building in general, had been discouraged, all so that decades later, we’re without a highly organized political infrastructure representing the interest of the Black African masses. The murder and imprisonment of our Black radical leaders, along with the dissemination of illicit drugs in throughout majority Black communities in the late 1970s and 1980s served the purpose of, not only disconnecting Black people from their spiritual selves, but snuffing out any desire for Black Africans to amass political power. Mass incarceration provided Babylonian politicians sufficient cover to relinquish the vote from segments of the Black African community, and with it the power to navigate society through other means. As a result, dysfunction and illiteracy have been normalized and celebrated. Instead of studying the complexity of Our environment and the deceit of those sworn to protect community interests, We shy away from politics, convincing ourselves that speaking to the Babylonians in the political arena doesn’t bring about change, even though it’s provided the tools for our contemporary dissent. Many of Us outside of the “conscious” circles have joined the Democratic Party because they seem the most liberal of the two major parties, though its platform doesn’t support Black African self-determination. That type of thinking brought President Barack Obama into office twice, and led swaths of uninformed Black Africans to blame third-party voters, not white people, for President Trump’s win in 2016. Even worse, many of Us, caught up in the minute-by-minute drama of national politics that don’t have much bearing on our lives relative to other aspects of the subject, take pride in not knowing our neighborhood commissioner or council members, the men and women who write legislation directly tied to our daily activities. Many of Us speak vaguely about breaking away from this nation, without any understanding of how political representation asserts the nation’s power, and proves essential in the diplomatic affairs that make nation building easier. But then again, power may not be what we desire subconsciously. The Black African nation, doesn’t have control over its affairs, in part because, in Our pursuit for all other markers of success, We bought into the propaganda of the American melting pot, and along with it, any substantial opportunity to organize a mass movement among Black Africans that passes down knowledge about community governance. We want to be friends with our racial peers, while they want power. Instead of producing, we consume, especially politically, as can be seen in our delusional relationship with the Democratic Party. It’s been assumed by many Black African people that, because of the historical mistreatment of African people on U.S. soil that continues to this day, any local, state, and national government formed under the U.S. Constitution doesn’t protect African people’s interests. While that’s true, dangerous absolutist thinking has us ready to bow out of this reality instead of building our own political force that could push for conditions that encourage our eventual independence. Notice I said eventual independence. We’re not as independent of the American political system as we would like to believe. If we’re serious about nation building, and not only committed to Pan Africanism out of a need to follow trends, then we must develop a strategy to push back against the neighbors, Black, white, and other, who’ve taken our political silence for complicity and lack of knowledge. More specifically, We must do so as a unified front, for We carry a lot of political power when concentrated on a goal, like bringing President Obama to the White House. In embracing Garvey’s philosophy of self-determination and independence, many of us choose to opt out of the U.S. political system at all levels. Instead of politics, We focus on entrepreneurship. We grow our own food. We build our own schools. Most importantly and most frequently spoken among those who’ve absolved from politics, We reconnect with African spiritual systems taken away from Us during enslavement and colonialism. All of those strategies are essential, and encouraged as we continue to lay the foundation for what could be our own communities, cities, towns, and eventually nations that embody of a federation of Black African states. However, as the people of Tuskegee, Alabama, Lowndes County, Mississippi, Ferguson, Missouri, and Washington, D.C. will tell you, attempting to improve your life, or maintain a high quality of life, won’t be easy if you’re under the thumb of a local government ready to dissolve your resources, connections, and revenue streams within a matter of second. Being civically engaged and committed to destroying the system aren’t mutually exclusive, and they don’t have to be. 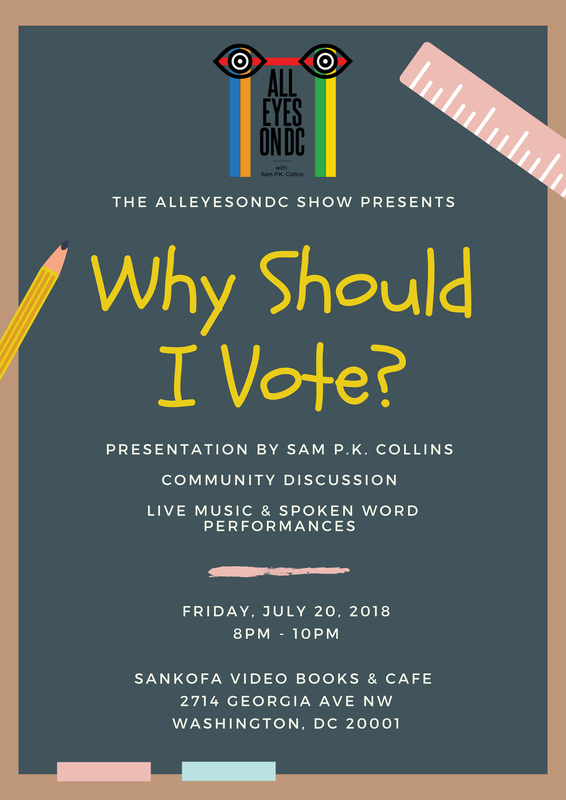 If you’re reading to stretch your mind a bit, study the science of voting, and remain committed to building a Black African nation, visit Sankofa Video Books & Cafe (2714 Georgia Ave NW) on Friday, July 20th at 8pm as we discuss the necessity of the vote, and civic engagement.